Create picture perfect settings and inspire outdoor enjoyment with these classic 46" round perforated steel patterned picnic tables. Constructed entirely with commercial grade steel, these recognizable outdoor tables feature popular perforated pattern tops and seats supported by a solid 1-5/8"O.D. reinforced steel tube frame. The MIG welded frames are engineered with a convenient walk through design—providing easy maneuverability in, out and around the seats. 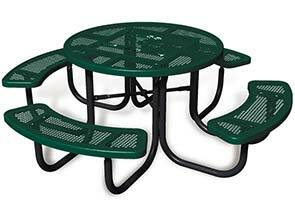 These all steel extra heavy-duty round picnic table feature top-of-the-line weather and vandal resistant finishes. Tables are available in a popular selection of color options—polyethylene finished tops and seats, the frames are powder-coated.